© 2002, © 2018 by Paul Freeman. Revised 7/26/18. Midway Airport, as depicted on the July 1960 Charlotte Sectional Chart. as it was not yet depicted on the January 1957 Charlotte Sectional Chart. The earliest depiction which has been located of Midway Airport was on the July 1960 Charlotte Sectional Chart. It depicted Midway Airport as having a 2,600' unpaved runway. 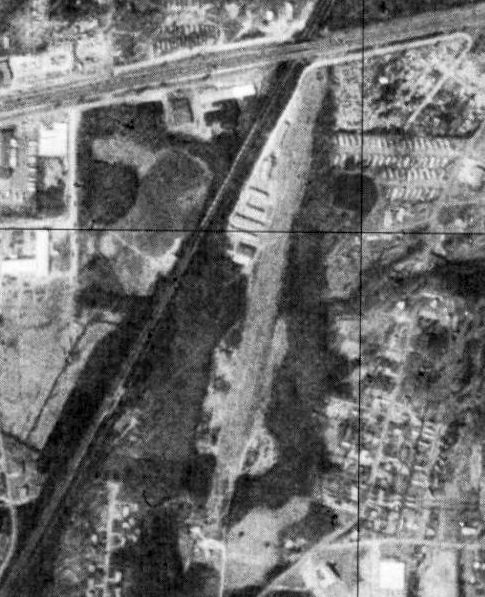 The earliest photo which has been located of Midway Airport was a 2/18/65 USGS aerial view. and 6 rows of hangars & 6 light aircraft visible parked outside. with several buildings on the west side. The last aeronautical chart depiction which has been located of Midway Airport was on the September 1970 Charlotte Sectional Chart. It depicted Midway Airport as having a 2,600' paved northeast/southwest runway. The last photo which has been located of Midway Airport was a 3/15/77 USGS aerial view. It depicted Midway Airport in the same configuration as the 1965 photo. The last depiction which has been located of Midway Airport was on the 1985 USGS topo map. which may indicate that the airport was closed by that point. as it was no longer depicted on the August 1990 Charlotte Sectional Chart (courtesy of Ron Plante). and the northern portion (site of the hangars) having been scraped clean. A 2013 aerial view showed no trace of Midway Airport. The site of Midway Airport is located southwest of the intersection of Interstate 85 & Old Thomasville Road. 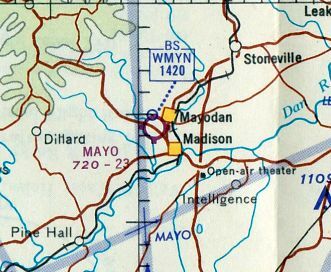 Mayo Airport, as depicted in the 1945 AAF Airfield Directory (courtesy of Scott Murdock). The date of construction of this little airfield has not been determined. Doug Garrou reported, “My Mom told me once – apparently a C-47 in some sort of distress had to land there during the war [WW2]. 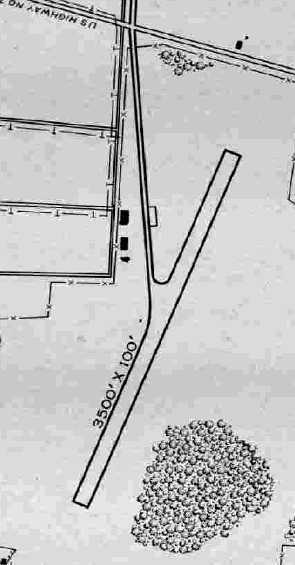 The earliest depiction which has been located of Mayo Airport was in the 1945 AAF Airfield Directory (courtesy of Scott Murdock). It described Mayo Airport as a 5 acre rectangular property having a single 1,100' easy/west turf runway. John Buontempo recalled, “Mayo Airport... I vividly remember the old airport & occasionally watching airshows there. 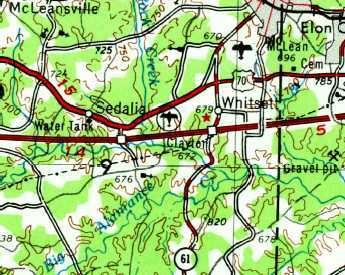 The airport was located at the intersection of NC Highway 704 West & Ayersville Road. The airport was owned & operated by Espie Joyce for his personal use but really open to the public. Mr. Joyce also owned a Studebaker dealership (as I best recall) located adjacent to the airport. I remember I used to take my children over to the airport on Saturday mornings to watch the planes fly in. We would walk around looking at the beautiful aircraft while the pilots & passengers ate at the restaurant. and did indeed operate the airport & a nearby Studebaker dealership, which was opened in the late 1940s. Espie & my grandmother, Lena Joyce, lived next to the airport. 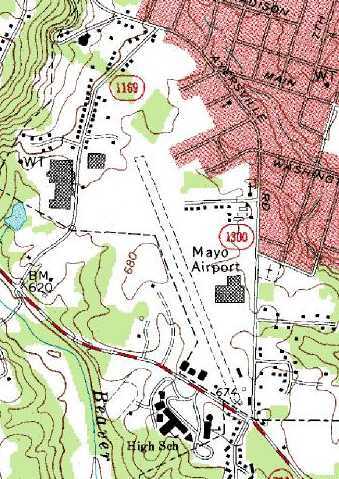 Mayo Airport, as depicted on the 1953 USGS topo map. was on the October 1965 Winston Salem Sectional Chart (courtesy of Ron Kunse). 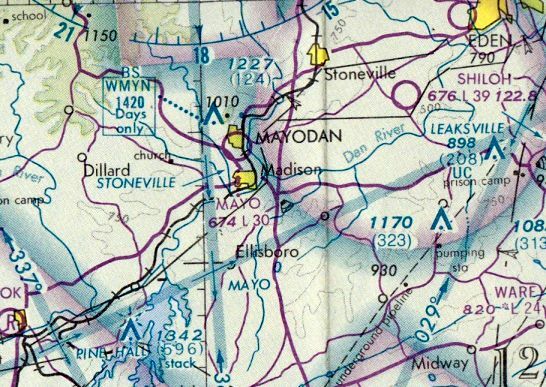 It depicted Mayo Airport as having a 2,300' unpaved runway. 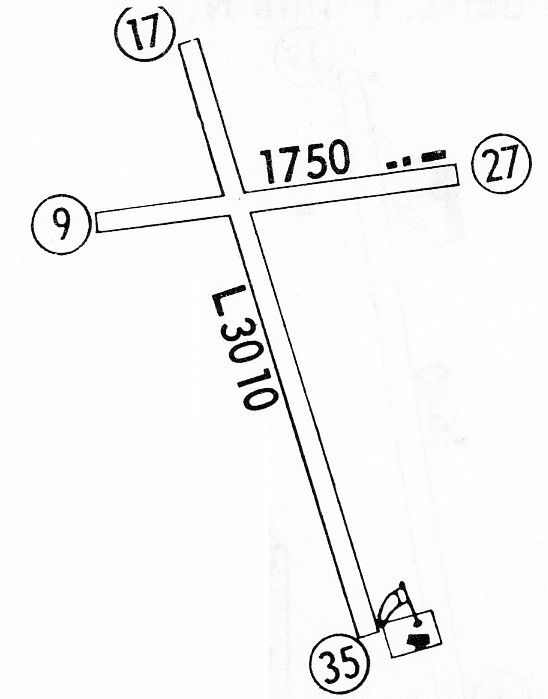 quite different than the runway orientation depicted in the 1945 directory. Doug Garrou reported, “I grew up visiting my grandmother in the summers (late 1960s, 1970s, and early 1980s) and watching Butch [Joyce] build & fly various aircraft at the Mayo Airport. The airport had an absolutely classic collection of airport characters – really an entertaining crowd & lots of amazing aircraft. I remember watching skydiving there & hearing one of the skydivers hit a tin roof in the adjacent neighborhood (no injuries luckily). I also have fond memories of cutting the grass runway using the tractor – which for some reason I was allowed to operate at a young age. I became a pilot years later & I’m sure it’s because it got into my blood at Mayo Airport. with the crosswind runway having been evidently closed at some point between 1968-71. 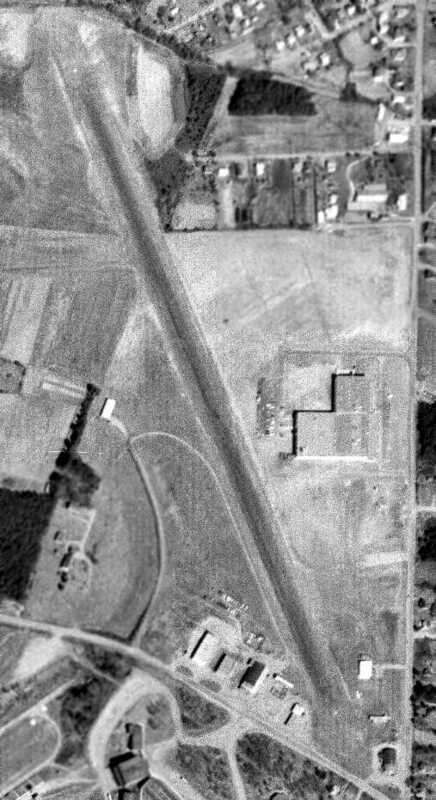 The only photo which has been located showing Mayo Airport while operational was a 3/14/71 USGS aerial view. with a few small buildings & one single-engine aircraft at the southeast corner. was on the August 1976 Cincinnati Sectional Chart (courtesy of Mitchell Hymowitz). 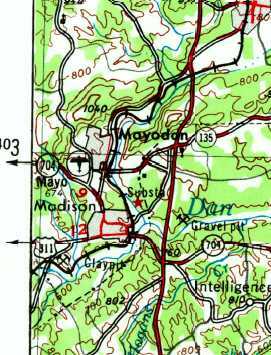 It depicted Mayo Airport as having a 3,000' unpaved runway. 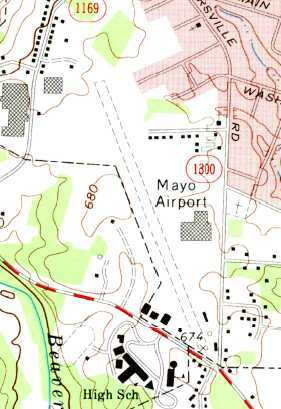 The 1991 USGS topo map depicted Mayo Airport as having a single unpaved northwest/southeast runway, with several small buildings along the east side. John Buontempo recalled, “His son Butch (Espie Jr.) took over the land & buildings upon the passing of his father & finally sold the property to a local textile firm. The textile firm developed the property by building a large office & warehouse facility on the existing runway. Later, the textile firm sold the property to Bridgestone Tires (ironically, they make and/or distribute aircraft tires in the warehouse now). depicted several large industrial buildings covering the southern half of the site, but the northern half of the runway remained intact. with the northern half of the runway remaining recognizable. Doug Garrou reported, “My uncle Butch was very active in the EAA & was a fixture at Oshkosh for many years as a member (and eventually President) of the Vintage/Antique/Classic Division. Sadly he died far too young, at the age of 68 in 2012 from a brain tumor. Thanks to John Buontempo for pointing out this airfield. 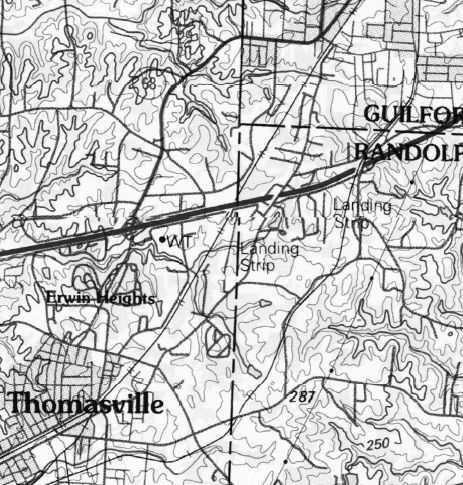 Clayton Airport, as depicted on the 1953 USGS topo map. 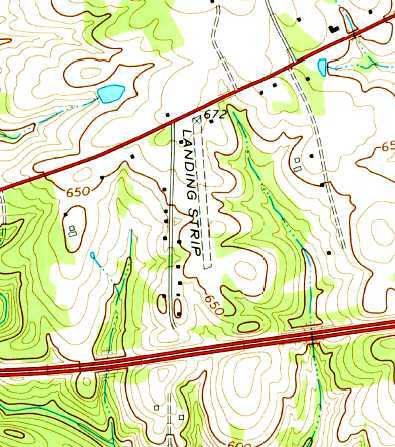 The earliest depiction of the field which has been located was on the 1953 USGS topo map. It labeled the field as “Clayton”. 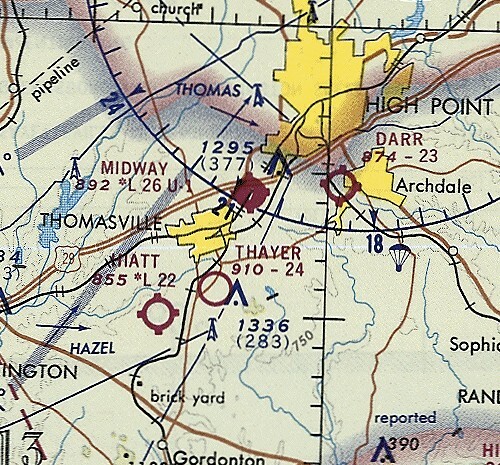 Clayton Airport was not yet depicted on the 1962 Charlotte Sectional Chart. The earliest photo which has been located of Clayton Airport was an 11/29/68 aerial view (courtesy of Dallam Oliver-Lee). It depicted over a dozen single-engine aircraft parked on the north side of a single north/south runway. A 2/19/69 aerial view (courtesy of Dallam Oliver-Lee) also showed over a dozen light aircraft parked on the field. and pilot that operated this field in the 1960s & 1970s. and he had quite a maintenance operation serving general aviation aircraft. He was a friendly, well-liked fellow that lived on the property with his family. 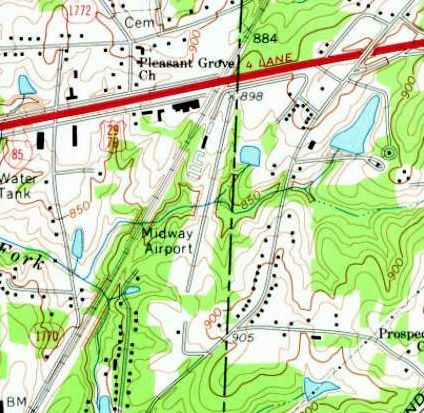 The 1970 USGS topo map depicted a single north/south runway, labeled simply as “Landing Strip”. It depicted Clayton Airport as having a 2,200' unpaved runway. 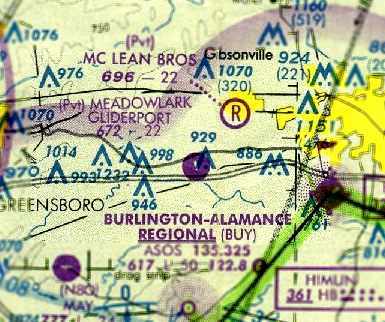 According to John Ritchie, “In 1979, Chic left his location in Whitsett & took over the operation of Tuck Airport in South Boston, VA.
Clayton Airport then later became Meadowlark Gliderport under new management. I didn't notice any gliders at Clayton Airport until it became Meadowlark. One of the interesting things about this field was that the runway centerline crossed I-85 at a perpendicular angle just south of the field. a few tiedowns west of the runway, no facilities, and was privately owned. One of the more interesting features of this airfield was the incredibly narrow paved runway. At only 5' wide it barely seemed wide enough to be a sidewalk, let alone a runway. but the $100 hamburgers at the Brightwood Inn across the street. before a concert at Williams High School in Burlington. Janet Williams recalled “flying & finally soloing in the old Tin Lizzy, the Schweizer 2-33A, at Meadowlark Gliderport in 1983. The fellow who owned the place in the 1980s was a retired dentist. He put quite a bit of money into building a shed for us to congregate & then a lounge. Wow - we were hot stuff. but without any aircraft visible on the field, in stark contrast to earlier photos. as a private field having a single 2,200' paved runway. 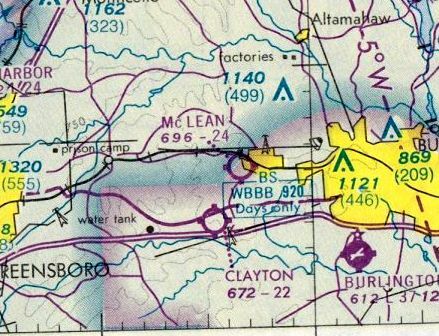 was on the 2000 NC Aeronautical Chart (courtesy of Jonathan Payne). It depicted Meadowlark Gliderport as a private field having a single 2,200' paved runway. as it was no longer depicted at all on the 2002 Sectional Chart (according to Jonathan Payne). 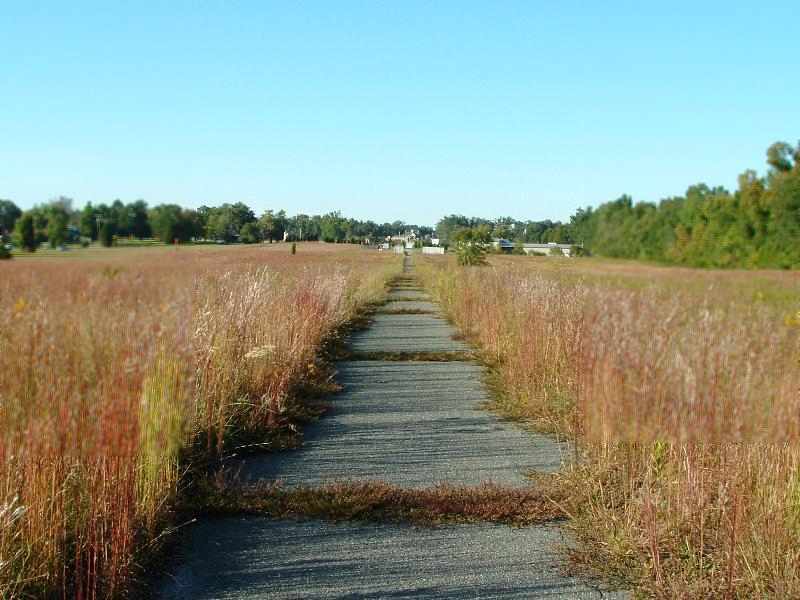 A 2006 photo by Jonathan Payne looking south along Meadowlark's former Runway 18.
have started cropping up all around the old airport. The runway still exists, but the grass is slowly starting to overtake it. A 2006 photo by Jonathan Payne looking north along the remains of Meadowlark's incredibly narrow paved Runway 36: a mere 5' wide..
A circa 2008 aerial view looking south at what appears to be the remains of 2 parallel paved runways at Meadowlark. A 4/5/13 aerial view looking southeast depicted the what appears to be the remains of 2 parallel paved runways at Meadowlark. A still from an 8/23/17 drone video by Jack Fessler looking south at the hangars & remains of 2 parallel paved runways at Meadowlark. Meadowlark Gliderport is located southeast of the intersection of Boone Valley Road & Burlington Road. A postmark commemorating the 7/3/33 dedication of Huffman Field. and Glenn Huffman & Dover Fogleman built an airfield here in 1931. Huffman Field was formally dedicated 7/3/33, as commemorated by a postmark. was in the 1934 Department of Commerce Airfield Directory (courtesy of Chris Kennedy). Two hangars were said to be located on the northwest corner of the field. 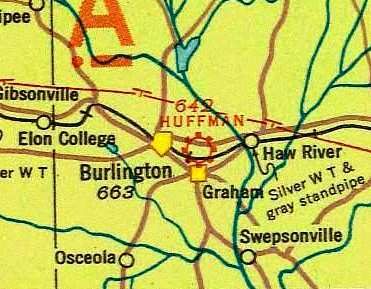 The earliest aeronautical chart depiction of Huffman Field which has been located was on a 1935 Airway Chart. A circa 1930s photo (courtesy of Almance County Area Chamber of Commerce) of a biplane & 2 monoplanes in front of a Huffman Field hangar. described Huffman as a commercial airport. and offer "hangars, fuel, and limited repairs". Robert Craddock recalled, “My Grandfather (a Burlington native) used to fly out of Fairchild field. on the May 1941 14M Regional Aeronautical Chart (courtesy of Chris Kennedy). and moved Fairchild Aircraft Company into it to begin production of a twin-engine training plane, the Fairchild AT-21 Gunner. and had a USAAF code of “FB” during WW2. displacing civilian aircraft operations to a location near Alamance. and was used to perform flight tests of the factory's new AT-21s. An undated (WW2-era) view of a Fairchild AT-21 Gunner flying over Alamance County. The AT-21 had fairly unusual construction, being built from plastified wood. with a single machine gun in the glazed nose & a top turret with twin machine guns. as well as learn to function as a member of a crew. An undated (WW2-era) view of AT-21s on the assembly line inside the Fairchild Factory in Burlington. The AT-21 had a brief production run & an extremely brief service life. The first AT-21 was completed at Burlington in 1943.
on the occasion of a speech by Governor Melville Broughton at the flight of the first plane built at the plant. 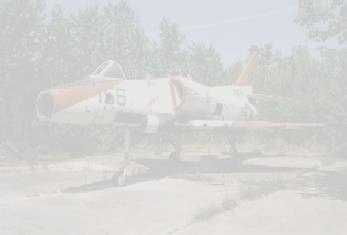 Production of the AT-21 ran for only one year, by which point the plant had turned out a total of 105 aircraft. when they were replaced by training examples of the actual aircraft in which the gunners would eventually serve. and the Firestone company moved in to produce guns as a part of the war effort. The war years brought tremendous growth to the area. where Eastlawn Elementary School & the City Schools Administration building are located today. 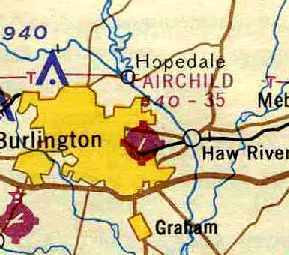 and the area became Fairchild Heights. on the March 1945 Winston Salem Sectional Chart (courtesy of Chris Kennedy). 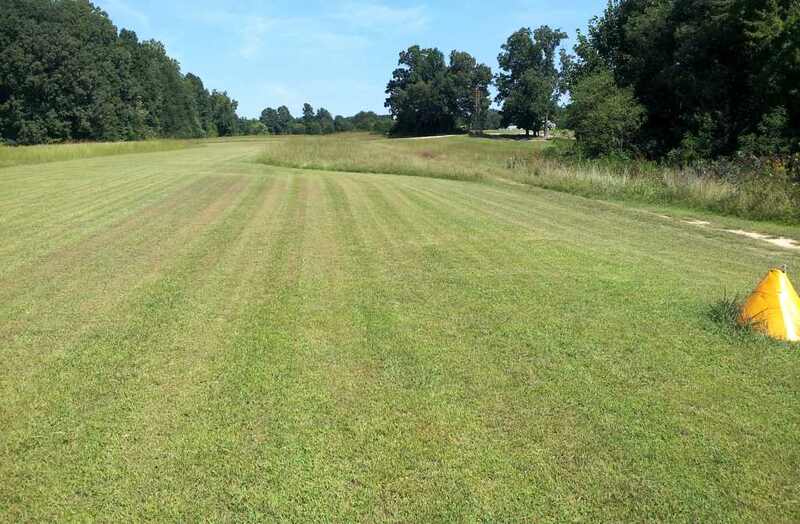 as a 227 acre irregularly-shaped property having a single 3,500' NNE/SSW asphalt runway. The field was said to have 2 hangars, depicted on the west side of the field, the largest being a 90' x 40' wood structure. and operated by private interests. After WW2 ended, the Western Electric Company took over the plant, which was still a government-owned facility. as Fairchild Field was depicted on the 1948 Winton-Salem Sectional Chart (according to Chris Kennedy). The earliest photo which has been located showing all of Fairchild Field was an 11/18/50 USGS aerial view. with a ramp & some small buildings on the northeast side, and the former Fairchild aircraft factory across the street. A circa 1950s aerial view looking northeast at Fairchild Field, with the former Fairchild aircraft factory at left, and the runway & 2 hangars at right (courtesy of Chris Laforet). A single-engine light plane can be seen above the runway (top-center of photo). A circa 1953 / early 1954 photo of a drag race held on the Fairchild Field runway, before they started using lights & racing into the evening hours (courtesy of Chris Laforet). According to Chris Laforet, “The races would run ¼ mile starting from the north end of the runway. The remaining runway would be used as the slowdown area. he said there was a low-wing Fairchild monoplane for sale at Fairchild Field for $350. 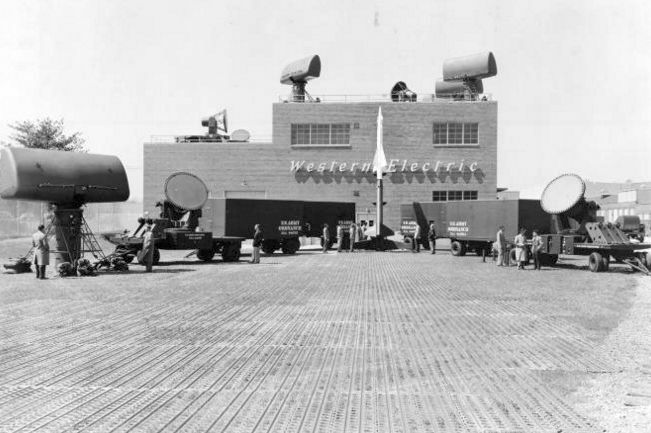 A circa 1950s photo of a display of Nike surface-to-air missile guidance radars manufactured at the Burlington plant. of the Nike Ajax & Hercules surface-to-air missile system at the Burlington plant. 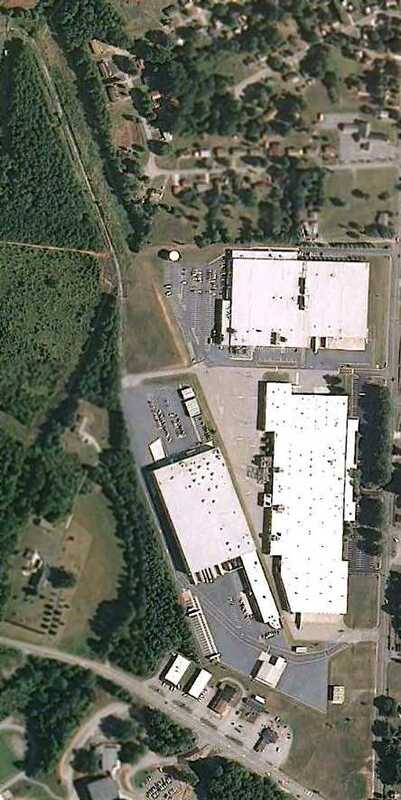 The 759,000-square-foot plant, also known at the Tarheel Army Missile Plant, was once the largest employer in Burlington. with a taxiway leading to a ramp on the west side of the field with a few small buildings (hangars?). and listed the operator as Alamance Aviation Service, Inc.
as having a single 3,500' paved runway. The last photo which has been located showing Fairchild Field in operation was an 2/1/67 USGS aerial view. It one single-engine aircraft on the ramp on the northwest side of the runway. as it was no longer listed among active airfields in the 1968 Flight Guide (courtesy of Bob Levittan). George Wallace held a rally at Huffman Field during his campaign for president in 1968, according to Eddie Huffman. and my father worked for four decades at the Western Electric (later AT&T) plant, located in the former Fairchild Aircraft plant. I have vague recollections of planes still taking off & landing there in the late 1960s or early 1970s. but treaties with the Soviet Union ended this program before it had a chance to begin. That resulted in severe cutbacks in production & employment at the Burlington plant. on the August 1972 Charlotte Sectional Chart (courtesy of Robert Brown). 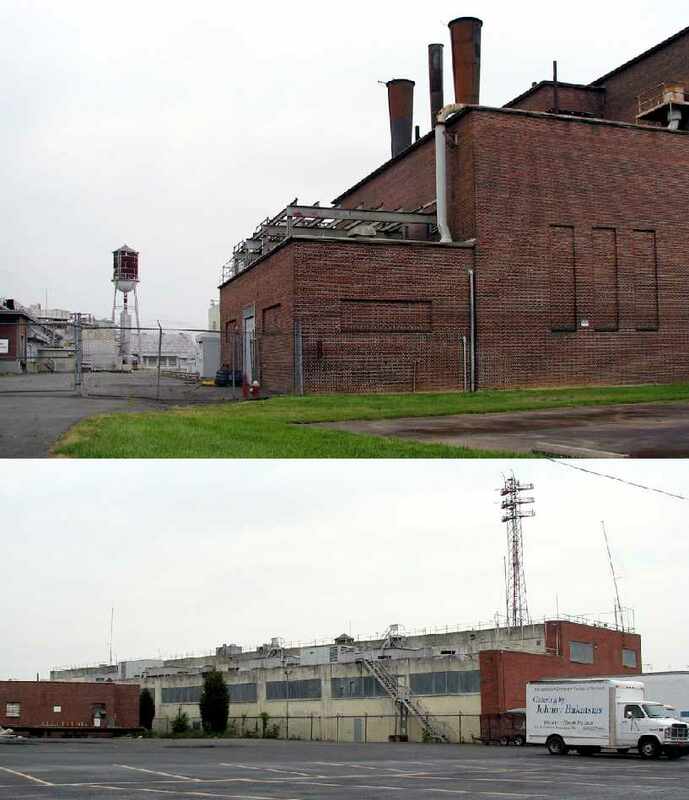 After the breakup of the Bell system in the 1980s, the Burlington plant became an AT&T facility. Jonathon Payne recalled, “My father grew up in the area & worked at the AT&T building in the late 1980s. At the time part of the building was used as a monitoring station for the Navy’s SOSUS sonar net in the North Atlantic. My father was a UNIX programmer for the station’s mainframe. 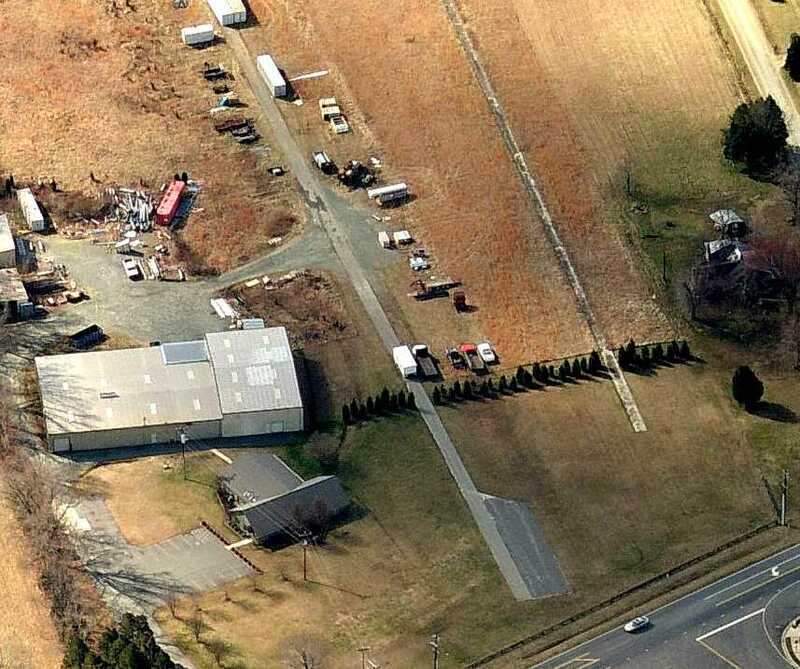 until AT&T moved to the Rock Creek Industrial Park in 1992. (both the original photo, and a version with the runway alignment superimposed by John Hunter). The former Fairchild aircraft factory at the northwest corner of the photo. According to John Hunter, "The remains of the runway are still visible if one knows what to look for. A Lowe's lumber store was built on the site as well as other commercial construction." the lumber yard used to be at the south end of the strip 20 years ago. The large white-roofed building top center (just north of US 70) is the old Fairchild plant. 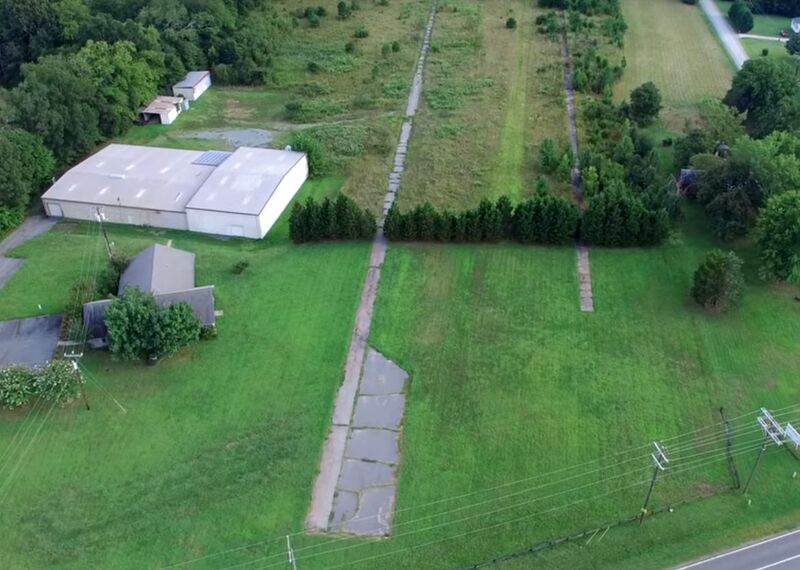 If you look at the vacant lot to the east of the plant you will see a small diagonal trail going southeast to US70. This is where the taxiway used to be. The taxiway terminated on the south side of US70 on the west side of the runway. and ran south along the large forest of trees grown up on the east side. I believe that personal inspection would yield some original runway pavement still remaining." 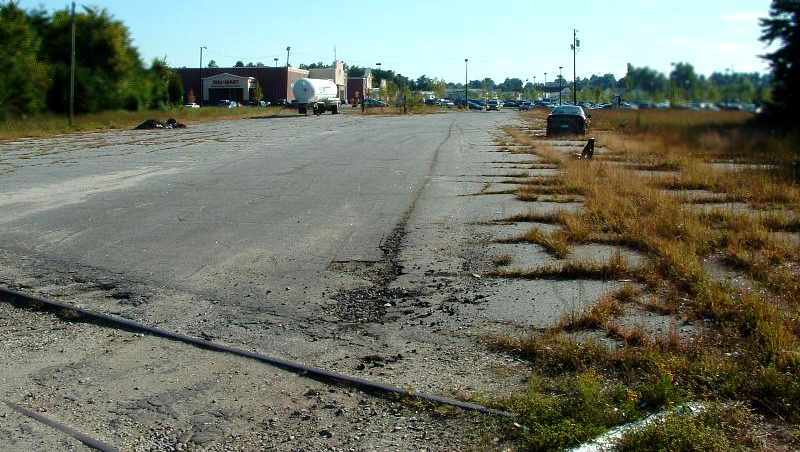 Eddie Huffman reported in 2005, “Most of the asphalt runway remained visible until 2004.
obliterating almost all that remained of the old runway. The Minor League baseball park just west of the former south end of the runway is still known as "Fairchild Field". Two 2006 photos by Scott Murdock of the former Fairchild factory. A Wal-Mart was built over a portion of the runway site, opening on 4/19/06. Jonathon Payne reported in 2006, “The new Wal-Mart was recently competed, obliterating most traces of the old runway. There is still a piece of the old runway on the north side of Mebane Street. The site of Fairchild Field is located at intersection of Route 70 & North Graham Hopedale Road. 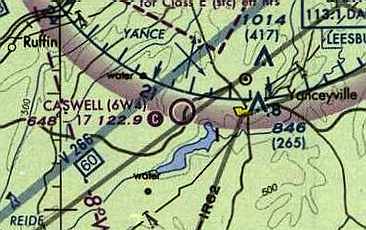 Caswell Airpark, as depicted on the October 1948 Winston-Salem Sectional Chart (courtesy of Chris Kennedy). 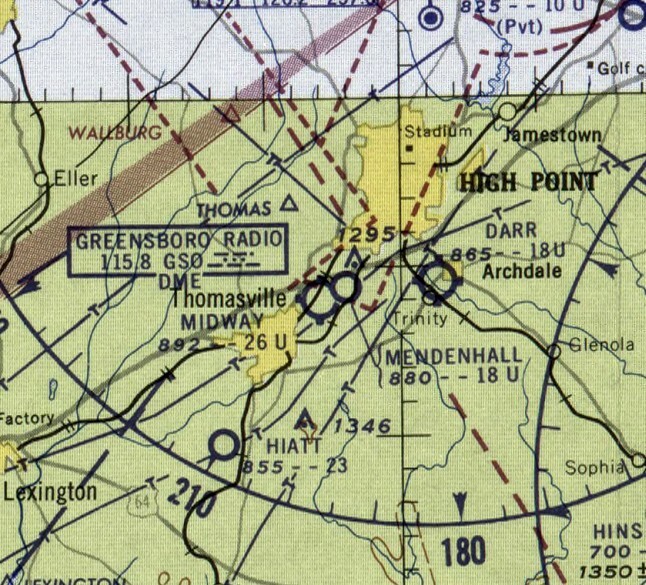 as it was not depicted on the March 1945 Winston-Salem Sectional Chart (according to Chris Kennedy). was on the October 1948 Winston-Salem Sectional Chart (courtesy of Chris Kennedy). It described the field as having a 2,000' unpaved runway. and was designed to spec by the Army Corps of Engineers. The field was equipped with a former Civil Defense tower. and said that the airport provided fuel, hangars, and tie-downs. 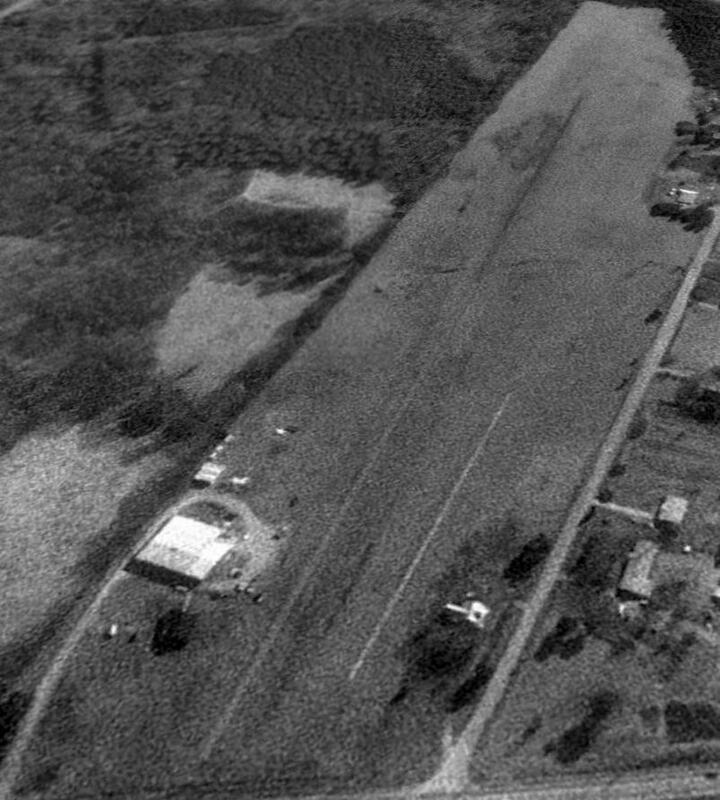 The earliest photo which has been located of Caswell Airport was a 1971 aerial view. It depicted Caswell as having a single northeast\southwest unpaved runway. as having a 2,100' unpaved runway. and had 4-6 'resident' planes – Cessna 152s, a Cessna 180, and a couple of Piper Tri-Pacers. 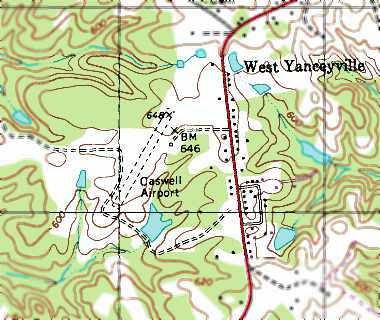 The 1991 USGS topo map depicted the Caswell Airport as having a single northeast\southwest unpaved runway. 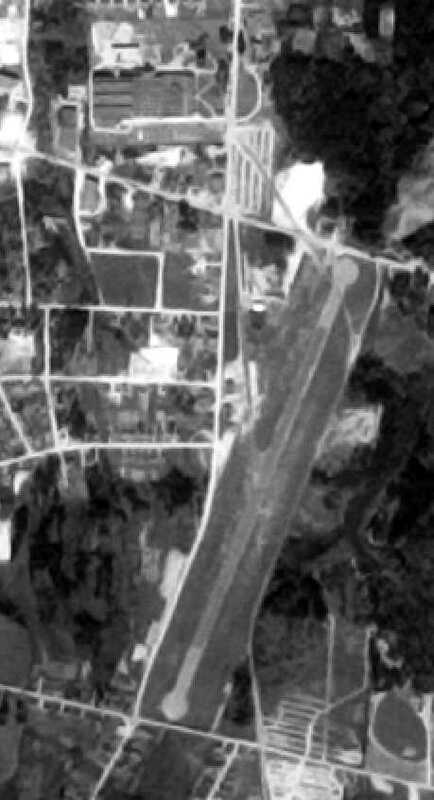 The earliest photo which is available of Caswell Airpark was a 1993 USGS aerial view looking southeast. 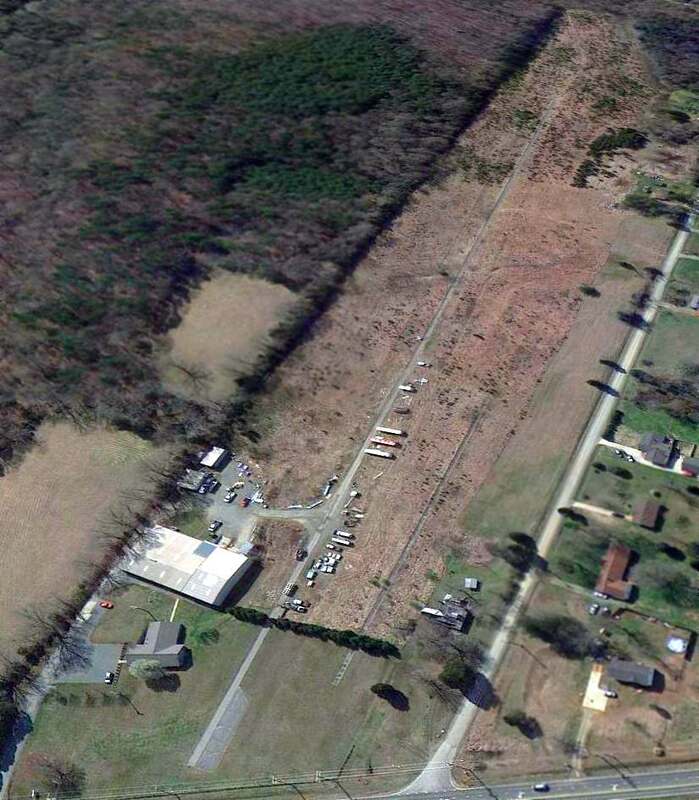 It showed Caswell to have a single grass northeast/southwest runway, with a small building on the east side. There were no planes visible on the field. 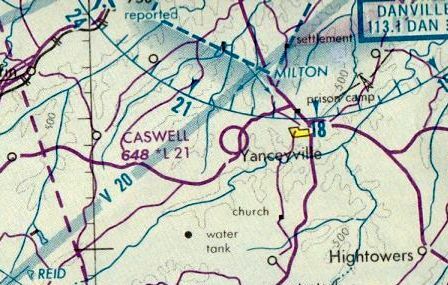 Caswell Airpark was depicted as an active public-use airport on the 1996 NC Aeronautical Chart. 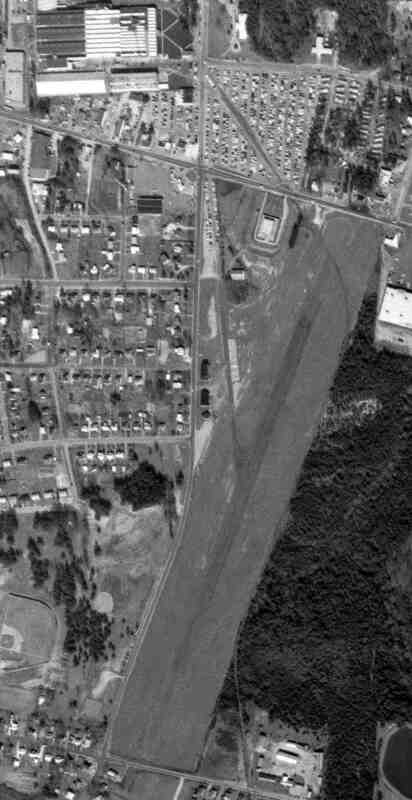 The 1998 USGS aerial photo showed Caswell to have a single grass northeast/southwest runway. and as having a single 2,050' sod Runway 4/22. evidently constructed under the runway during the Cold War to house a private "escape plane". Les Parker visited the hangar in 2003. His report: "The hangar is reinforced concrete & about 50' wide by 30' deep. Just enough of the floor is concrete to accommodate a small tricycle landing gear. The rest is just clay. The ramp up to the runway is paved about 2/3rds of the way up. There is about 15' of earth over the hangar up to the runway surface. There is a tractor stored out of the weather in the now unused hangar. It is open faced & I couldn't find any door mounts, but it did have electric power at one time. You can still see the conduit on the ceiling & walls. I thought the lack of 'blast doors' was odd, considering the supposed reason for construction. I believe a natural gully or depression was used & enlarged when the hangar was built. Yanceyville could have been 'Mayberry'. There are no first strike targets, that I am aware of, anywhere near by. Danville VA is about 15 miles away, to the north. The doors do face south. I was told by a 'local' who stopped by that the field was built by a wealthy doctor. I might venture to guess that some military branch may run training operations there. The runway looked pretty well mowed & has a tree-line at the west end. There is what appears to be an old Civil Defense tower still there." 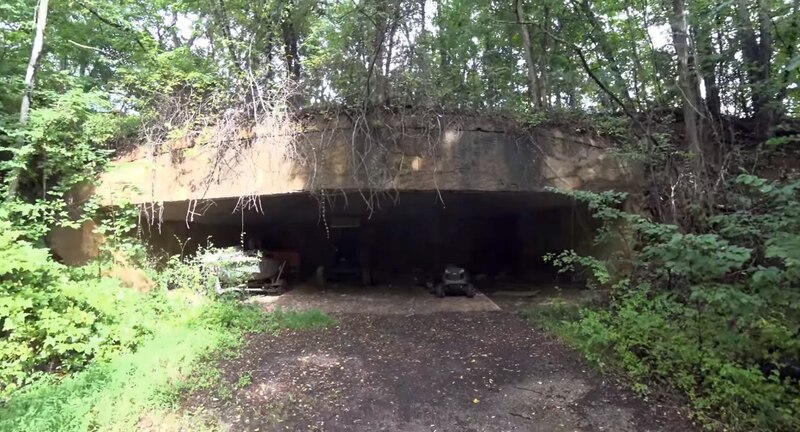 According to Graham Page, “Not far from the pictured underground hangar is an underground house / apartment that had blast doors, etc. Dr. Page could probably have been labeled as eccentric, but more than anything he just liked to experiment & try anything new. 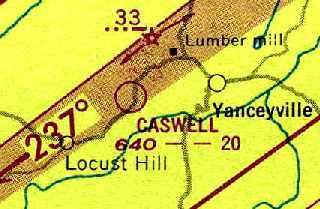 Caswell Airpark, as depicted on the 2004 Sectional Chart. and the owner was listed as Dr. G. Allison Page. seem to indicate that this field is used predominantly for military purposes. which are (inexplicably) described as "100% military". Furthermore, the Remarks section includes "Occasional nighttime military operations." has maintained an agreement with the regional military for use of the airport. They come in - do touch & go's, and occasionally there is a visit from Blackhawk helicopters running night training exercises. A 2013 photo by Alan Goodwin “looking approximately northeast towards the access road (off Highway 158) from about mid-field. 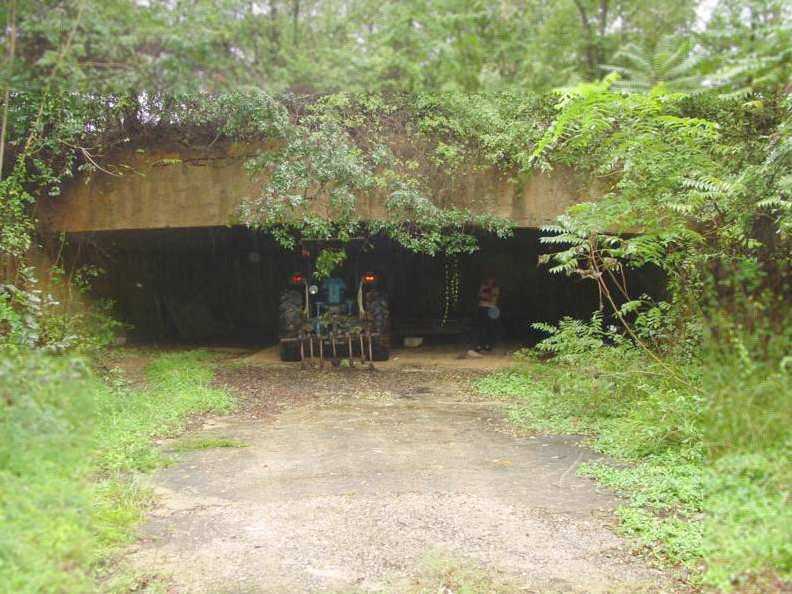 Alan Goodwin reported, “We arrived at the end of the access road which pretty much dead-ends at the edge of the runway under the oak trees. There are no signs directing you in any particular direction or to stay away. We thought no one was there but as we were taking our helmets off we saw a car coming up the side of the runway. We greeted the driver & he informed us that there were more folks up the path & we should head there. We hopped back on our bikes & headed in that direction. That's where we found the 'carport at the airport' & a few gentlemen preparing their radio-controlled planes for flight. We were welcomed by the group & had a great time talking aircraft & local history. There wasn't too much knowledge about the history of Caswell itself or it's creator. They didn't even know of the underground hangar. They did know it was privately owned by a gentleman that lived in nearby Yanceyville. Alan continued, “The area around the airpark looked to have been logged at some point in the last year or so and the brush was growing back. I tried locating the underground hangar but the brush was very thick & prevented me from doing so. (as if you were coming from Highway 158, if from the carport you'd be making a u-turn to the right). The hangar access is before & parallel the path that leads down the runway to the carport. Alan continued, “The runway itself looks to be very smooth. The grass, at least the portions that are kept mowed, are in good shape. It has a distinct downhill slope with the northeast end being higher. The southwest end has a drop-off at the extreme end of the runway. Running a plane off that end is probably not advisable as you're likely to not get it back. The terrain to the sides of the runway varies. The northwest side is mostly flat or slight uphill with the southeast side having several drop-offs. These are the same drop-offs that seem to facilitate the existence of the underground hangar. 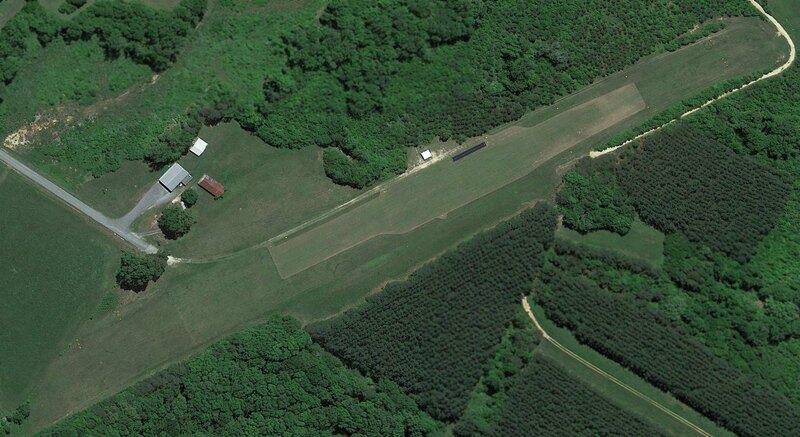 A 2017 aerial view looking southeast depicted Caswell Airpark to have a single grass northeast/southwest runway. A short black model aircraft runway had evidently been constructed on the east side of the grass runway at some point between 2016-17. 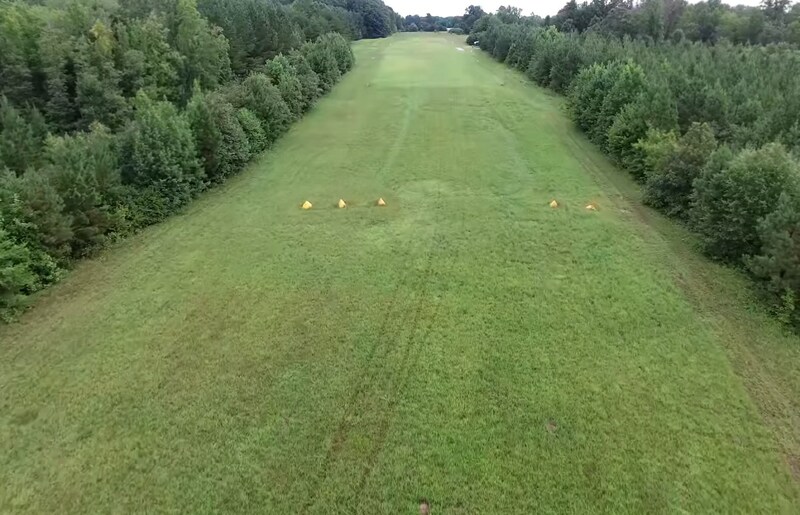 A still from a 2018 drone aerial video by Jack Fessler looking southwest along Caswell Airpark's grass runway. Jack reported, “The model airplane runway is not paved at all, but a cleverly designed piece of black plastic tarp stretched taut with white lines painted on it! It would support a model aircraft that weighed a few pounds, but nothing more. 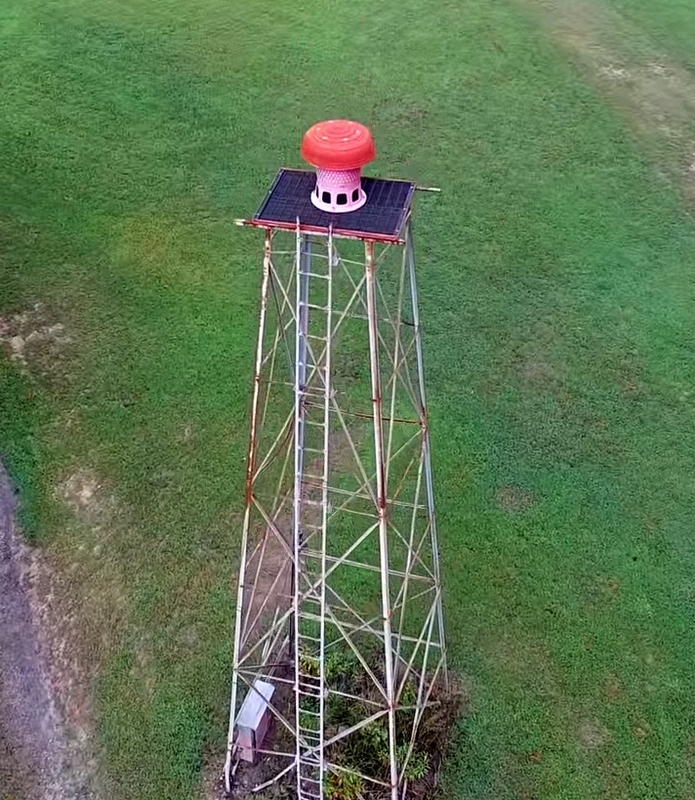 A still from a 2018 drone aerial video by Jack Fessler of Caswell Airpark's civil defense tower. A still from a 2018 drone aerial video by Jack Fessler of Caswell Airpark's blast-resistant underground hangar. 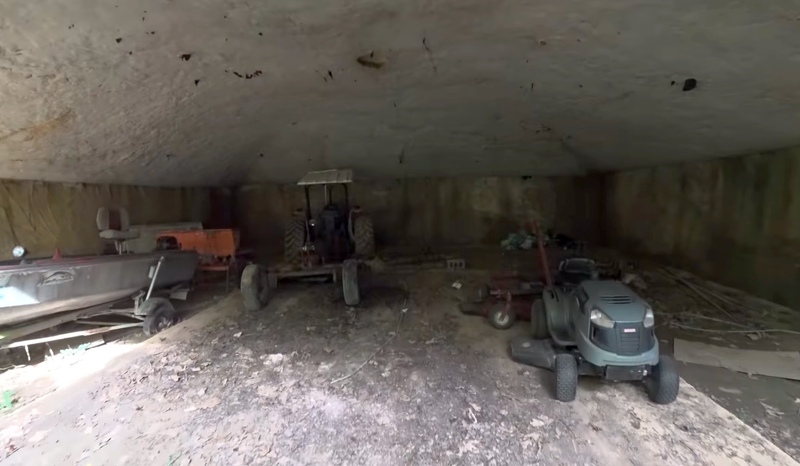 A still from a 2018 drone aerial video by Jack Fessler of the interior of Caswell Airpark's underground hangar. Caswell Airpark is located west of the intersection of Route 158 & Hodges Dairy Road.